It seems just as cities started to really grasp the value of event sponsorship as an economic driver, the recession came along and is making them think twice. In Southern Cal's Coachella Valley for instance, Mariecar Mendoza of the Desert Sun writes that city officials are being forced to cut back on sponsorship investments — some by at least half — due to the economy. In cities throughout the country, officials are being forced to make tough calls about which properties in their own communities get sponsorship dollars and which are cutback victims. What would cause a city to sponsor an event already held in their town in the first place? Afterall, conventional wisdom might say it's better to target a city's tourism marketing dollars to external locales in an effort to bring them to your city, rather than to market to people already in town. The hope, for city officials at least, is that sponsorship brings increased tourism dollars and “brand awareness” for their cities. Others may argue that event sponsorship is wasteful in the midst of cutbacks in critical city services like police and fire departments. 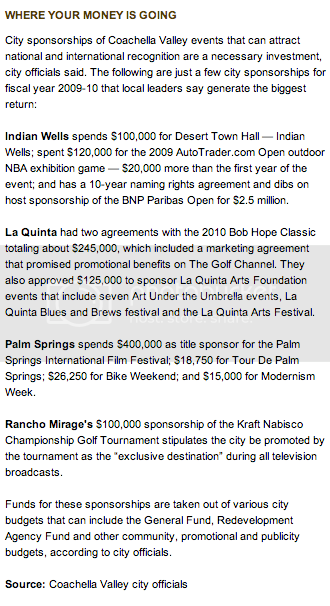 According to a city of La Quinta and Bob Hope Classic Visitor Profile Survey cited in the piece, visitors the 2009 Bob Hope Classic golf tournament spent an average of $368 a day on food, lodging, shopping and recreation. Coachella Valley cities, Mendoza writes, invest more than $3 million annually in sponsoring local events like the BNP Paribas Open tennis event, Bob Hope Classic and local music festivals. Officials say they're committed to balancing their cities' financial needs with a commitment to local events. While local residents almost always want the city to spend smarter, few people want to see events leave the local area.